Knuth: Young lady, did you just snicker at MIX? Woman: Oh no, Dr. Knuth! Actually I was imagining you as an expert witness in Joel Tenenbaum's trial. . .
Woman: . . . using MIX code to demonstrate the remittitur infinite loop! Knuth: Young lady, I can't tell if you are serious. Do you think the RIAA could even make sense of MIX? Woman: They could have a court interpreter doing MIX-English simultaneous translation. You know, like they do for Spanish-English. Man: I don't think that would work. 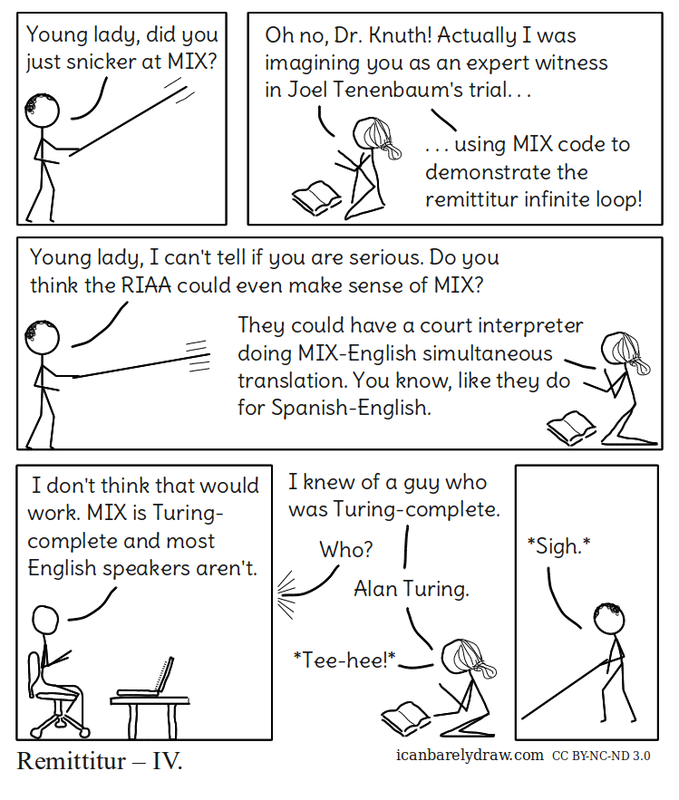 MIX is Turing-complete and most English speakers aren't. Woman: I knew of a guy who was Turing-complete.